I was thinking about YHWH today and realized an early on name for God might have been the sound of breathing as God breathed life into us, then imagined how you might write that and realized YHWH, if pronounced, is an onomatopoeia of the sound you make when you breath. If I was tasked with writing the word for the sound of breath, in English, it would likely come out something like heehoo or something similar—perhaps with the Hebrew alphabet yhwh (יהוה) is a more probable attempt. Is it possible that YHWH could be the full name intended, and it on purpose has no vowels; or is there strong evidence that it is an actual word, not an onomatopoeia, and vowels were omitted for some other purpose (I think I was told that once). As a Hebrew speaker, I can tell you that יהוה comes from the verb "be". It is pronounced Yahweh and it is kind of an onomatopoeia for the verb "be", but nobody says it. The Hebrew word YHWH is not a name but a description. You cannot pronounced the Hebrew word YHWH pertaining to the Name of God. Moses was given a scene in the burning bush a man cruficified. The word YHWH is the origin why a God given name had a meaning or a mission attached to it. Starting from Jesus Christ, Mary and Prophets and Patriarchs and Old Testament names had a corresponding meaning and mission that defines the life of the bearer of the name. 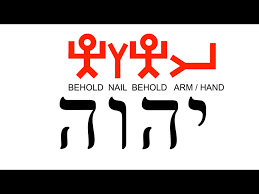 YHWH tetragammanton means "Behold the Hand, Behold the Nails". This means, Moses was able to see the pre-figurement of Jesus at the Foot of the Cross as the means of God Salvation. They are pronounced, in Hebrew, "Yod Hey Vav Hey," when you read them in the Hebrew manner from right to left. "BEHOLD THE NAIL, BEHOLD THE HAND!" Or, "Behold the nailed hand." The greatest mystery behind the Hebrew word YHWH is the word "BEHOLD"
Behold means to gaze. and Moses was given the chance to BEHOLD that Man Crucified at the Cross. Jesus at the Foot of the Cross uttered the word "BEHOLD" to the Woman and to St.John the beloved Apostles. God commanded Moses to BEHOLD and Jesus commanded the Woman to BEHOLD.We either represents St.John or the other Mary's and we too are commanded by Jesus to BEHOLD His sacrifice "At the Foot of the Cross". But we can only BEHOLD the Crucified Christ and understand the meaning of the Cross of Christ if each one of us welcome Mary in our home, meaning allowing Mary to be our own Mother too as the greatest gift of Jesus Christ to all of us. Not the answer you're looking for? Browse other questions tagged hebrew tetragrammaton or ask your own question. Yhwh: Exodus 3, 14. «I am that I am» and relationship to Metaphysics as Ontology? Why does it appear that judeo-christian sects avoid referring to the god they worship by his name? Do any Christian denominations forbid pronouncing the Tetragrammaton? What was the first translation to transliterate the tetragrammaton?